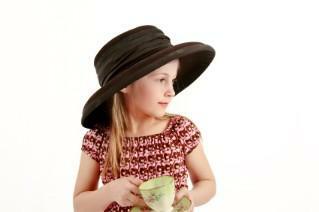 Wear a hat to a tea party. Hosting a mad hatters tea party is an imaginative alternative to the typical tea party. Perfect for a birthday party, bachelorette party or as a child's tea party, the mad hatter twist on this traditionally sophisticated party is sure to amuse all your guests. Lewis Carroll's famous book Alice in Wonderland features the Mad Hatter and the March Hare hosting a continuous tea party, for it is always 6 o'clock in the evening. For many people, the character of the Mad Hatter evokes an image of a silly, nonsensical person. Plenty of ideas for a tea party are prim and proper, so hosting a mad hatters tea party is something that balks the traditional quaint notions of the tea party itself. Invitations are the best way to get the word out about your upcoming tea party. Consider hosting it at 6 p.m., as that is the time of the party in the book. Choose a shaped invite that looks like a crazy top hat or cut a teapot out of brightly colored invitation paper. Make sure you note that the party is a mad hatters one, and make mention if guests are welcome to wear their wildest hats or even dress up in Alice in Wonderland costumes. Use wording for theme party invitations to get your message across. Consider using a take on the classic lines from the book and movie in the first line of your invitation, like "Don't be late for this very important date!" Use mismatched teapots, cups and saucers. Cover the tables in vibrant and bold-colored tablecloths, like fuchsia, lemon yellow or neon green. Make centerpieces by flipping flowers upside down in vases or pots, so their roots are sticking up. Host the tea party outside, instead of in the formal dining room. No tea party is complete without serving your guests some great food and playing games that even the Mad Hatter himself would be happy to play. Skip the usual scones and petits fours at this outrageous party. Instead, focus on the growing and shrinking aspect of Carroll's book. Make jumbo muffins and mini muffins. Serve small truffles and large chocolate chunks. Cut fruit into varying shapes for a salad. Finally, cookies in the shape of a top hot and decorated with bright royal icing would also be a big hit. Put place cards next to each serving tray with the words "eat me" written on them. Hang a small tag that reads, "drink me" around teapots on each table. When it comes to games and activities at the party, gather ideas from the original story. Adults might enjoy a rousing game of croquet, playing cards or even partaking in a chess tournament. Host a contest for someone to come up with the best answer to the raven riddle, with a small prize. Adults might even enjoy making red and white origami roses.Because children are usually familiar with the Disney movie version of Alice in Wonderland and that version of the Mad Hatter, take cues from that to create fun activities. Lead the children in playing musical chairs, decorating their own crazy hats or concocting their own unique "tea" blends (using powdered juice drink packets). A mad hatters tea party is a wonderful way to celebrate a birthday. The Disney movie has the Mad Hatter and March Hare celebrating "un-birthday" parties for everyone-in other words, the days of the year that are not your birthday. To celebrate an un-birthday, consider hosting a surprise party that is several weeks or even months before the person's birthday. Use any of the ideas previously listed to create this mad and crazy tea party. Top it off with an Alice in Wonderland birthday cake that includes trick candles which won't go out when the birthday boy or girl blows on them. Try a new twist on typical tea party ideas by hosting one with a mad hatter theme. Plan some amusing games, crazy invitations, vibrant decorations and delicious treats for everyone to share at this zany tea party.